At the SoWa Open Market recently, sandwiched between Big Moe King of Ribs and Bon Me food trucks, was a small table covered in a green banner featuring what looked like a misshapen humpback whale. The table offered the produce in the illustration, bitter melon. The vegetable, popular in Asia, is pungent and indeed bitter. The National Bitter Melon Council, host of the table, is trying to spread the word about its beloved vegetable. “Happy Bitter Melon Appreciation Day!’’ chimed Andi Sutton, a member of the council, which is part community organization and part performance art troupe. Samples of bitter melon salad, available at the Bon Me truck, combined raw melon with cantaloupe, red onion, and vinaigrette. 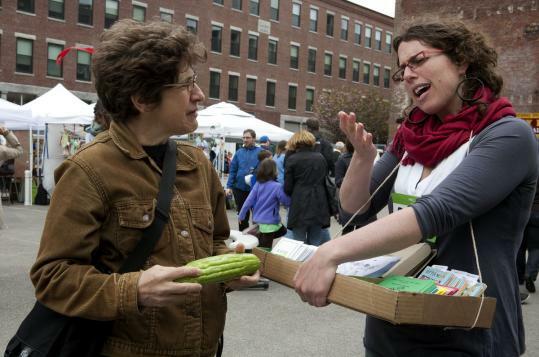 “If you balance it out with other things it works a lot better,’’ said Colin Wilkins, a Jamaica Plain resident volunteering with the council to read essays aloud from “Better Living Through Bitter Melon: A Manual.’’ A human-size melon mascot was on hand, dancing and posing for photographs. “It was a little creepy,’’ said Leslie Kay, 12, of Watertown. “But I wanted to hug it.’’ The Bitter Melon Council will be at South End First Friday Open Studios on June 3, from 5-9 p.m., 450 Harrison Ave., Boston. For more information, go to bittermelon.org.